Lakewood Ranch, FL is a desirable place to live because of the excellent weather and beauty in the area. Even though the weather is generally comfortable most of the year, there is a possibility that you could be facing the impact of a hurricane during storm season. If you own a home in or around Lakewood Ranch, you need to make sure you are doing your part to protect your home. Here at Armored Dade Windows & Shutters, we have seen the damage that can happen if a homeowner isn’t prepared for hurricane season. Our goal is to improve the quality of your home and prevent damage to your windows. We offer high-quality products and competitive prices, making it easy for you to keep your family safe during the storm. Don’t be fooled into thinking your home won’t be affected if a hurricane moves through Lakewood Ranch, FL. If you are lucky, your property might miss the brunt of the storm. It is hard to predict the pathway of the storm. There are no guarantees that you won’t suffer damage from the hurricane. Windows are often the first area where damage occurs during a storm. Weak windows can easily be broken because of items flying through the air. When the windows sustain damage, it starts a chain reaction that could affect the structural integrity of your home. It might seem easy to repair a broken window, but the damaged glass is usually just the beginning of the repairs that will need to be addressed. Damaged windows allow the hurricane force winds to move inside, which changes the air pressure in your home. The air needs to move somewhere and it often goes up. As a result, intense pressure is placed on the roof of the building. Broken windows are weak points that will threaten the structural security of your home. If you want to avoid serious damage, you need to address your windows by keeping them strong and secure to avoid damage. When the weather prediction gives the warning that a hurricane is coming, it is often too late to make necessary changes. It takes time to choose and install the right windows and hurricane shutters. You need to invest in your home right now to protect your family all year long. Upgrading to hurricane resistant windows can give you the peace of mind that you are protecting your investment in the property. If an evacuation needs to happen, you will be able to secure your home before you leave and move to a different area. How are Impact Resistant Windows Made? The design of impact resistant windows is quite different than basic windows. These windows are built using shatter-resistant glass, decreasing the likelihood that shards of glass will fly around if something breaks the panes. The most common way to design these windows is by using two panes of glass with a protective shatter-resistant shield in between. The middle part holds the glass if something breaks to avoid the large shards of glass that could be thrown around in a storm. Not only are these windows beneficial during a storm, but you will also find other benefits the rest of the year. 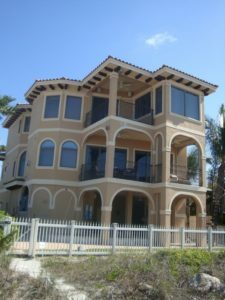 As you are enjoying the beautiful weather in Lakewood Ranch, you will see these windows improve the comfort of your home. High-quality windows are an excellent way to boost the energy efficiency of your property. When you are running the air conditioner, you want the cool air to stay inside. These windows will help seal your home, keeping the comfortable temperatures indoors. Even on the hottest days of summer, it is possible to decrease your energy usage and maintain a comfortable temperature at the same time. These insulated windows are also great to keep out the noises that are happening around the neighborhood. Have you found it difficult to relax at home because you are always hearing kids yelling outside or dogs barking in the area? These noises can be an inconvenience, impacting the comfort of your home and your ability to relax. Improve the windows and you will see that the insulation helps block the sounds. When you are ready to learn more about the benefits of hurricane impact resistant windows, the best thing to do is contact our team at Armored Dade Windows & Shutters for more information. We will gladly provide a complimentary estimate to help you plan your home renovations. Visit us at 8112 Cortez Rd W Bradenton, FL 34210. Or call to schedule a time for you estimate: (941) 798-9010.